By symmetry, supersonic flow in a concave corner that turns though an angle is equivalent to one half of the flow pattern that results when a supersonic fluid is normally incident on a symmetric wedge of nose angle . This is illustrated in Figure 15.4. It is clear, from the figure, that the presence of the wedge only affects the flow in the region that lies to the right of the two shock fronts that are attached to the wedge apex, . In particular, the presence of the apex at only affects the flow in the region that lies to the right of the shock fronts. Figure 15.4: Supersonic flow over symmetric wedge. The part of Figure 15.2 that we are presently considering (i.e., ) is such that a decrease in the wedge angle, , corresponds to a decrease in the wave angle, . When decreases to zero (causing the wedge to disappear), decreases to the limiting value . 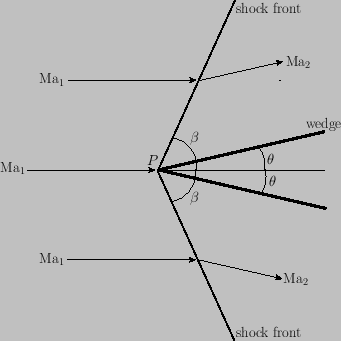 Moreover, the shock strength (which parameterizes the jump in quantities across the shock front) becomes zero. (See Section 15.4.) In fact, there is no disturbance in the flow in the limit . Thus, in Figure 15.4, there is no longer anything unique about the point ; indeed, this point might correspond to any point in the flow. The angle is simply a characteristic angle associated with the local Mach number of the flow, according to the relation (15.6). As we have already mentioned, is known as the Mach angle. Note that for . 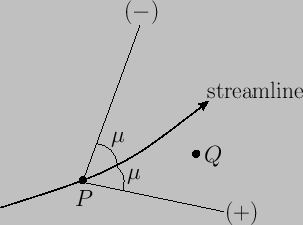 The lines of inclination (with respect to the upstream directed streamline) that may be drawn at any point in the flow are known as Mach lines. At a general point, , there are always two lines that intersect the local streamline at the angle . (In three-dimensional flow, the Mach lines define a conical surface with apex , known as a Mach cone.) Thus, a two-dimensional supersonic flow pattern is associated with two families of Mach lines. These are conventionally distinguished by the labels and . Those lying in the set run to the right of the (upstream directed) streamline, whereas those in the set run to the left. (See Figure 15.5.) Mach lines are also sometimes called characteristics. It is clear, from our previous discussion, that the flow conditions at point can only affect those at some other point if the latter point lies between the and Mach lines passing through point . (See Figure 15.5, as well as Exercise ii.) Hence, we deduce that, unlike subsonic flow, there is no upstream influence in supersonic flow. Oblique shocks can also be distinguished by the labels and , according to which set of characteristics they asymptote to in the limit of zero shock strength. Figure: Right- and left-running Mach lines [labeled and , respectively] emanating from an arbitrary point, , in a supersonic flow field.